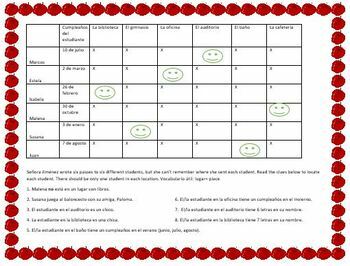 This is a one-page logic puzzle in Spanish that focuses on places in a school: (auditorio, gimnasio, biblioteca, etc). 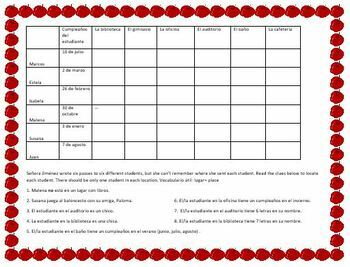 Students will read eight clues in Spanish to try to figure out which room in a school, each of the six students are. Also reviewed are days, months of the year, and seasons. Logic puzzles are fun and they're very good for students' brains. The instructions are written in English (for research-based reasons) but you may translate the to Spanish if you wish. Answer key is included. Enjoy!